How much time do you spend washing, folding and ironing laundry per week? Even with the help of my husband, my children and our cleaning lady, I still spend at least half a day a week working on it. If not more! I was just sorting through the laundry, and while folding the the boys’ underwear I realised that there is a little trick that helps me so much with figuring out which piece of clothing belongs to what child: colour coding. It is so simple! 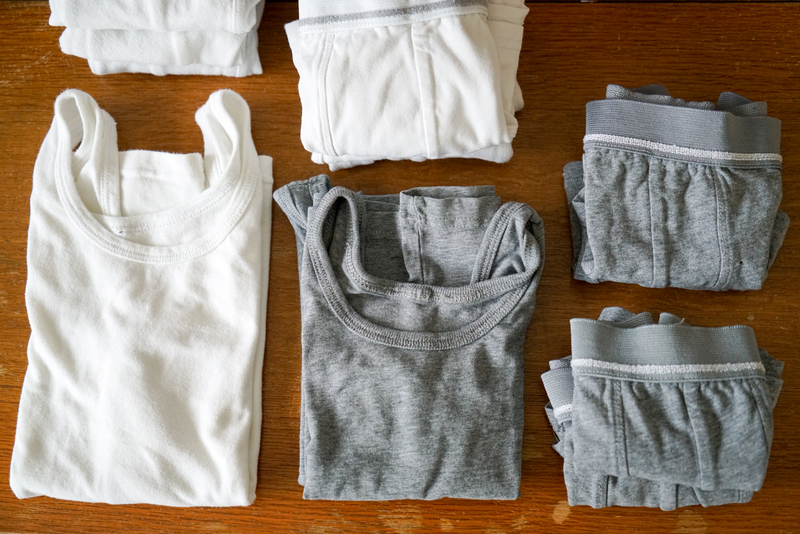 I always buy the boys underwear from Dutch department store Hema; the grey ones for Casper and the white ones for Pim. Presto! Instantly recognisable. As opposed to my girls’ underwear, which is usually white and from Petit Bateau: I always have to check the label which size is Ava’s (6 ans) and which is Sara’s (12 ans). It drives me crazy. It drives my husband even more crazy! It drives everybody crazy! Isn’t that just the easiest trick? Colour coding definitely makes laundry sorting so much easier. Tell me — do you have a trick like that? Please share — because the fewer hours we spend on laundry, the better! Aha!!! Colour coding is your friend and I definitely use it for all my kids, especially with socks… and towels and water bottles and school books and just about everything. Socks require a little more creativity: One person just has dots and another has stripes, one only has black and another has brights and so on. I made the mistake one year of getting all my boys the same winter boots and it was a nightmare trying to get out the front door as everyone stumbled at the shoe basket. Also, I need to be able to see who has left their things lying around… and fast!!! So here’s my tip: the oldest child has one dot on his labels, all the way down to the eighth kid… just eight small dots on the label. And the reason for dots… is when they outgrow something and hand it down to the next younger sibling… I just add a dot… I don’t have to scratch out names or relabel… just add a dot. Also when they are gifted the same thing, I whip out my marker and immediately dot things!!! It sounds crazy but it is so worth it. Somethings you don’t want their names written on, like the outside of their backpacks… but if they have dots on the corner… I can immediately remind a child to gather their backpack before we go… there is definitely an art to having a handful of kids or more!!! Se7en, you may just have changed my life! We have 4 and the older 2 boys are almost identical in size, the number of times i have had issues and fights about whose is whose, e.g. with 2 pair of black snow boots, identical but a half size different…arghhh! I love this dot system idea! I did the same with the children´s bedding. Stars for our son, dots for our daughter because the all-white scheme from when we just had 1 child, had become a nightmare with trying to figure out which is a cot-size sheet and which a junior-bed size. To cut down on laundry loads, I also try to have a limited palette of colours so that I don´t have so much sorting and separate loads. We all have black and grey neutral basics and the kids each have 1 main accent colour (in a variety of shades) that is whatever their favourite colour is. It also makes their wardrobe so easy for mix-and-match as anything looks good together. I have to admit that we don´t really fold laundry for the most part. I bought some drawer divider boxes and that keeps things sorted by type. As my kids get older maybe they can start to fold, but for now this ensures they can put away their own laundry independently and we can still find things. As my kids (girl 5, boy 3, girl 1) clothes are quite easy to distinguish -due to age difference and boy/girls – I do not have to work wit marking. However, I do recognise the enormous amount of laundry. My trick with getting it into the drawers is that I make baskets with the sorted clothes. When I fold in the evening I put the baskets in their room so that I can quickly put it in the drawers at a convenient time. This avoids having to sort (again). Saves some time for me! the do tip is GENIOUS!!! I miss the Aussie sun, India. Everything takes so long to dry in the U.K. I hate using the tumble dryer – it ruins clothes and is so bad for the environment! Are still damp!) i love the Shirley Hughes books with the long washing lines in the gardens!!! Ahhh, the trick in my large large large family growing up? Everyone does their own laundry. I’ve been doing my own laundry since I was 7. I like to think it builds character… probably because I didn’t have a choice, haha. Ah laundry nightmares! I have three children in identical school uniform. A massive time-saver in sorting are the coloured name tapes I ordered from Cash’s. The eldest child’s nametapes are blue, middle green and the little one is red. A big game-changer for my laundry time!